Ruth Amos is a Senior Editor at DK on their licensing team. She’s also the author of several Star Wars and Marvel books. She was kind enough to answer a few questions via email for 365 Days of Star Wars Women. Watching the original trilogy as a child with my older brother and dad at home. Growing up, my brother would sneak up behind me and do Darth Vader breathing in my ear to scare me. Or sing the Imperial March loudly. Who are some of your favorite Star Wars characters and have those favorites changed much over time? I’ve always adored Chewie, he’s so brave and unwaveringly loyal. And best of all, he’s super hairy. His fur has three layers!! I love Jyn and Rey – it’s great to be able to watch more and more films with exciting female characters as the main protagonists. There’s still a long way to go, but things are changing. I also like Asajj Ventress as her journey has been so complicated. And a special shout-out to Salacious B. Crumb just for being weird. How long have you been with DK and what was your path to getting a position there? Six and a half years. I knew I wanted to work in publishing after I left university. I spent nearly two years doing work experience, internships and what felt like endless job applications (the financial recession had just started in the UK when I left uni and publishing jobs were quite hard to come by.) Eventually a vacancy came up in DK’s Licensing department for an editorial assistant, and luckily I got the job! What is your current role at DK and what does a typical day (if you have them!) look like for you in this position. I’m now a Senior Editor in the Licensing team. We make books for Star Wars, Disney, Marvel, LEGO, DC and more. Every day is different! The team of editors and designers I work with are a bunch of lovely, creative, talented, hilarious people, and more than half of them are women. On a typical day I’m developing the direction of a book editorially, emailing authors, editing text, taking in licensors’ comments, or chatting to my colleagues about em dashes, who the Avengers really are, and what’s the best way to describe the Force succinctly in a teeny tiny text box with accompanying image. Still not solved the latter! You were the editor on Star Wars: Absolutely Everything You Need to Know. There’s so much information in this book. How did you figure out which facts would be included and how this book would be organized? 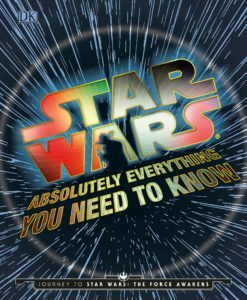 With Absolutely Everything You Need to Know, we asked our authors to cherry-pick the weirdest and most wonderful facts about Star Wars – preferably strange, gross or quirky! We used a really fun graphic design, with fact boxes, Q&As, Did You Knows, charts, lists and stats sprinkled liberally over the pages. Every spread (two pages laid out side by side) was deliberately designed to be completely different from the last. Unusually for DK, this book was led by the text, which was written first, and then the spread was designed to fit it afterwards. We usually work the other way round, with design first and text afterwards. 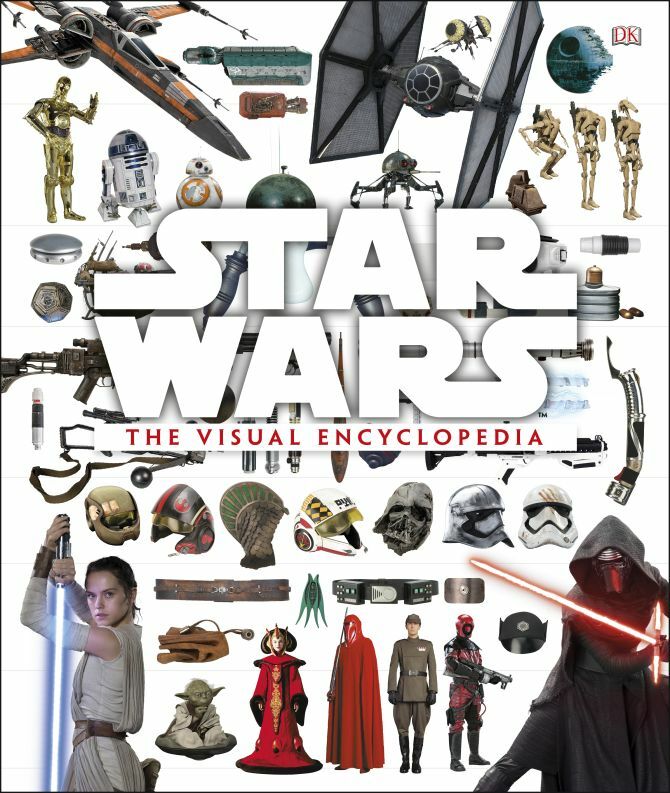 Speaking of books filled with Star Wars information you were also the Project Editor for Star Wars: The Visual Encyclopedia. The visual dictionaries for Star Wars films have been around for some time but was this the first Star Wars visual encyclopedia? What did you do in your role as Project Editor for this book? Do you think there will be updates for this book in the future? The Visual Encyclopedia is one of my favourite books that I’ve worked on so far – I don’t have a favourite, as it’s too difficult to choose, but I really love this one! It was the first book DK made that takes a taxonomical approach to Star Wars. Everything is divided into five chapters: Geography, Culture, Nature, History, Science & Technology and then sub-divided again into many more niche categories: planets, plants, helmets, mammals, criminal professions, interior design… My favourite spreads are probably in the Culture chapter, which includes everything from toys and musical instruments to art and fresh food. I led the editorial team, working out the categories for each spread, liaising with our three authors, Tricia Barr, Cole Horton and Adam Bray, and editing their text. As for updates in the future, I don’t know, but it would be great! I’m curious for Star Wars reference books how many of the images are created for the books and how many come from the Lucasfilm archives. The majority come from Lucasfilm archives. On a rare occasion we might shoot photographs here at DK, for example, the stormtrooper on the cover of Ultimate Star Wars. However, there are other types of books where we might want to use a different type of image – for instance graphic illustrations, which DK’s designers will often create themselves or commission. For Star Wars Maker Lab, DK’s team built all the cool craft models and then photographed them. The layouts of DK reference books always impress me. Can you explain how many people are involved with the design and look of the pages in these books. Loads of people! It’s always a big collaboration between designers and editors. We work in teams for each project, and I’m always in awe of everyone’s creativity. At the start of a project, we have discussions about what the style and feel of the book should be, what kind of design elements we want to feature on a spread, which types of colours and fonts we want to use, how the editor’s synopsis will impact the styling and much more. It’s always a group effort. You have written several books including Star Wars: The Last Jedi: Heroes of the Galaxy. I actually bought this book for one of my kids because I’m a fan of the visual dictionaries and loved the idea of a similar type of book geared towards younger readers. I’m curious what challenges you faced writing that book and if you had the chance to see the film before you wrote it (and if not what information you used to write the book). No, I didn’t see the film before it came out. Due to printing schedules and the fact that our books were published on the same day as the film’s release, we were creating our books at around the same time as film production. A very select few at DK were given access to the script, from which we planned and wrote our books, in close collaboration with Lucasfilm. You’re also one of the authors on the upcoming book Marvel: Fearless and Fantastic! Female Super Heroes Save the World. How would you describe this book to Marvel fans? 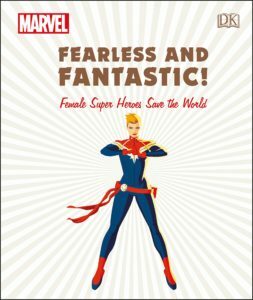 An inspiring treasure trove of fierce female Super Heroes from Marvel’s comics! It features gorgeous comic-book illustrations and profiles of many different brave girls and women – some of them have flaws and make mistakes, but all have tried their best and persisted along their paths. I loved working with the wonderful writer Sam Maggs, my fellow editor Emma Grange and our designer Rosamund Bird. The chapters are based on personal qualities – Daring, Compassionate, Determined and Curious – which was my manager Sadie Smith’s brilliant idea. As women, it felt like we were collaborating together on something really special. The original idea for the book was dreamt up by another fabulous editor, Beth Davies. I know you’ve been to a few Star Wars Celebrations. Do you have any highlights from those conventions? SO many! They were fantastic. At the one in London 2016 I remember walking around the corner and being amazed at the sight of about 8 people getting incredible, intricate Star Wars tattoos, right there at the event! Celebration in Orlando in 2017 was really special – it was my first real business trip AND my first ever trip to the US. I was staggered by the size of the convention hall, the number of fans and the effort they’d put into every detail of their costumes. I really enjoyed working on DK’s book stand with our lovely US Marketing and Publicity team. Just chatting to fans about our Star Wars books, what they like about them and what they want to read in the future was so valuable. Tricia invited me to speak on a Fangirls Going Rogue podcast, and I also took part in a panel with our authors to discuss making the Visual Encyclopedia – I was very nervous but had a great time. Can you share any projects you have coming up you can talk about? 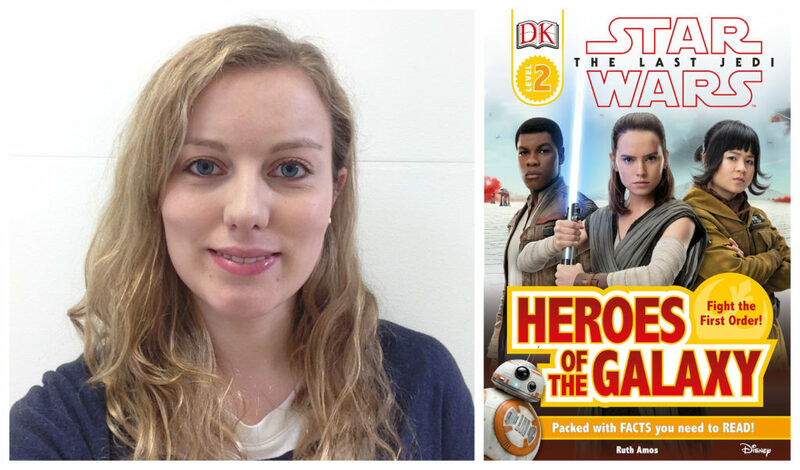 Our team has just finished working on four great new Star Wars: Meet the Heroes and Meet the Villains titles. They are aimed at young readers and will be published next year in May and September. They are really bright, fun, illustrated books, each of which focuses on a character (R2-D2, Chewbacca, Darth Vader and Stormtroopers) with clear, straightforward Q&As. Good for Younglings!